Working with hundreds of financial advisors and broker dealers since our founding in 2014, we get asked a lot of questions about the work that we do. Our showcase roundups are a great opportunity for us to not only answer those questions but to also give our team the opportunity to pause and reflect on the outstanding creative work we’re delivering to our clients. At Twenty Over Ten, we aim to bring each advisor’s digital marketing visions to reality by creating stunning and compliant websites. 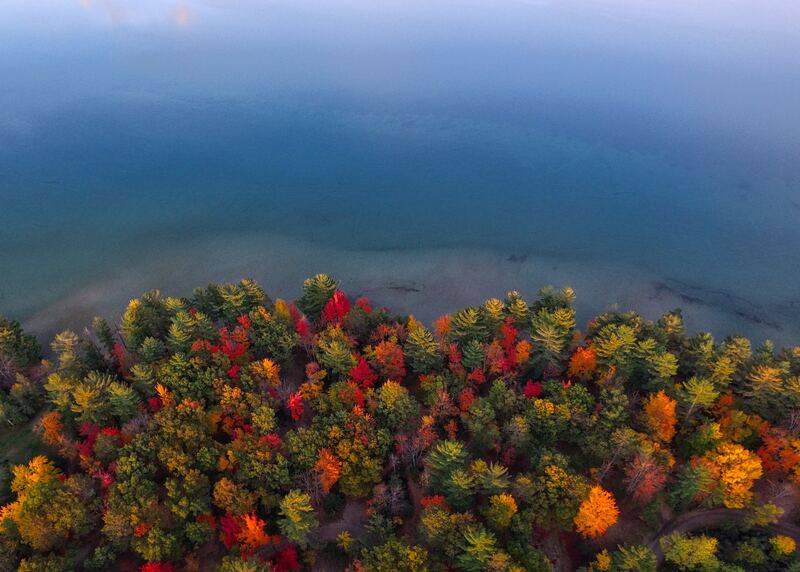 This fall season was much more than just pumpkin spiced lattes for our team as we worked hard alongside many advisors and broker dealers to create unique, stunning websites to fuel their marketing machines. Read on to see what we’ve been busy creating! Working with Mark Sharp of Financial Planning Done Right was a true pleasure. 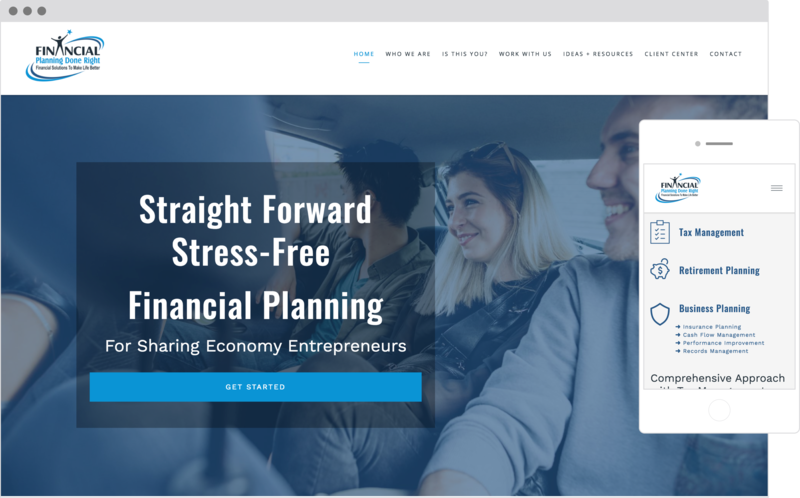 Mark’s brand new firm specializes in working with sharing economy entrepreneurs nationwide. 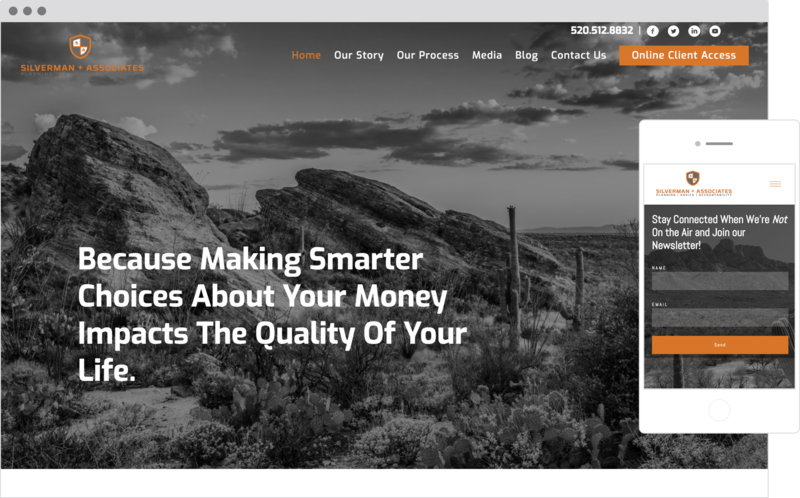 With inspiring CTAs (Calls-To-Action), an interactive community forum and a library with a host of free content, the Financial Planning Done Right website is a true marketing machine. 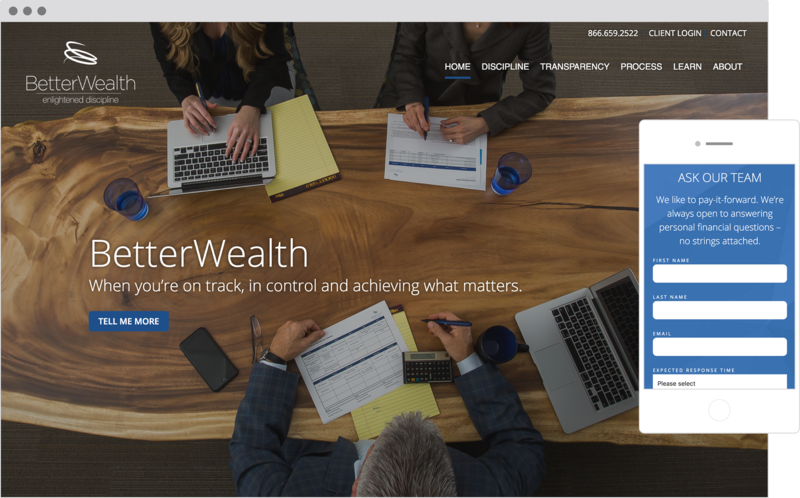 Wealth Shield’s website is noteworthy for its extremely clean design and incorporation of moving images and video. Using a parallax scrolling design, visitors can easy reach each section of the website in one scroll. Broken up with a simple white, black, and green color scheme, we love how uniform and simple the content is dispersed. One feature that differentiates the Wealth Shield site from others is their seamless featured moving images and embedded YouTube videos. Another favorite of ours this season is Better Wealth and we even got to partner with our good friend Kirk Lowe from Top Advisor Marketing on this one. Their site does a great job of incorporating an advantageous set of resources in a clean and simple design. 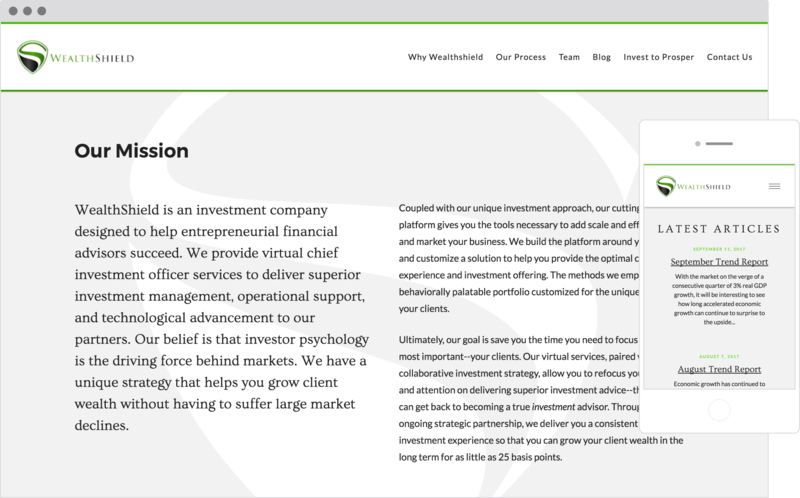 Strategically placed CTAs throughout drive visitors to the financial planning firms podcast, blog, videos, market reports and insight papers. Custom shot photography gives their site an extra leg up creating a cohesive and powerful brand identity throughout every page of their site. Adam Waitkevich loved working with the Twenty Over Ten team so much so that this is his second website build with us (check out his first site, Coppertree). 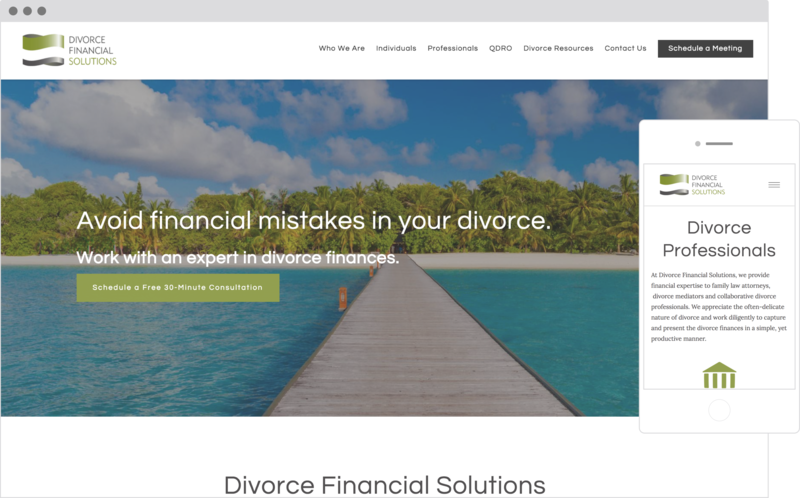 The new Divorce Financial Solutions is Adam’s second website built on the Twenty Over Ten platform and we love this one just as much as the first. This sophisticated website allows visitors to easily navigate and gain insightful and helpful information on divorce financial planning and what to expect when working with Adam and his team. CTAs throughout encourage visitors to set up free consultations and schedule meetings, making the site a true lead generation hub. Silverman Associates is one of our many favorites. Videos are flawlessly incorporated in the design to display content in a very different yet captivating way. One of the features that truly differentiates their website is the ability for visitors to engage with the team and even ask questions that may be answered on air of the $aving With $ilverman radio show. With other features like a newsletter signup, blog and client login center; the Silverman Associates site really does have it all. We thought you might. That’s why we offer 14-day FREE trials and waived monthly fees.